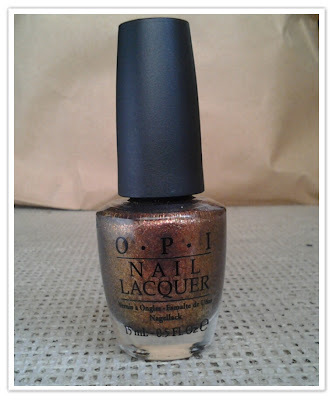 What I Blog About When I Blog About Books: OPI "Warm and Fozzie"
Today's nail of the day is my favorite polish from OPI's Muppet Collection last year, "Warm and Fozzie." 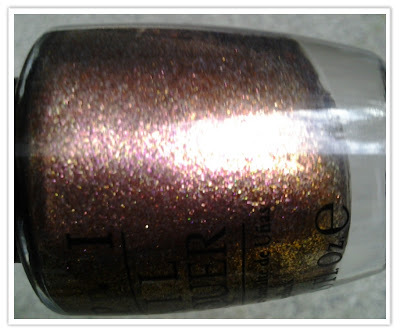 This polish was my runner-up polish to wear for Thanksgiving Day 2011 and is a brown foil with multi-colored shimmers. Even those words can't explain how amazing this color is. From the photos below you can see how gorgeous this color is. Despite the fact that it was released in a holiday collection, "Warm and Fozzie" is amazingly appropriate for the Autumn season. The multi-colored shimmers in it are the best part. It's not just a brown. You can see some pink, gold, and green in it as well. The formula of this polish is also like "Pros and Bronze" and OPI's "Goldeneye" from the new Skyfall collection. 3 thin coats are required for opacity. This is one of those colors where I find myself constantly staring at my nails throughout the day. Completely gorgeous and complex. This is another one of those polishes that I spend extra time photographing just to barely capture what makes it truly unique. When I did my OPI "Pros and Bronze" nail of the day I was convinced I would have to repeat it for Thanksgiving Day 2012, but now I feel like it's "Warm and Fozzie's" chance to shine.